After months of speculation, countless rumours and claimed leaks, Samsung has officially unveiled the eagerly awaited Samsung Galaxy S3 with the handset confirmed for release later this month. The most hotly anticipated Android handset to date, the Samsung Galaxy S3 is set to build on the strong foundations laid out by its Galaxy S and Galaxy S2 predecessors with a new quad-core processor leading a band of hugely impressive specs. With styling similarities to the curved edge design found on the Samsung Galaxy Nexus, the S3, which is to forgo the standard black in favour of 'Pebble Blue' and 'Marble White' colour forms, will come packing Google's latest Android 4.0 Ice Cream Sandwich operating system direct from the box. A true powerhouse of the smartphone sector the S3 has expanded on the market-leading array of innards that made its predecessor a global success with the company's own 1.4GHz Exynos quad-core processor providing the grunt alongside a welcomed 1GB of RAM. Adding inches to past models the newly confirmed S3 lines up with an expansive 4.8-inch HD Super AMOLED display with stunning visuals handled with ease thanks to the screen's eye wateringly attractive 1280 x 720p resolution and 306 pixels-per-inch image density that puts is only marginally lower than the iPhone 4S' Retina display. Lining up on the rear to keep consumers appeased and the snap-happy grinning, an 8-megapixel camera features with 1080p Full HD video recording capabilities. Adding to the handset's photographic and video capturing capabilities, the S3 also plays host to an impressive 1.9-megapixel front-facing snapper that holds its own with 720p HD video. Setting the Galaxy S3 apart from the flurry of high-end Android competitors and the Apple iPhone 4S, Samsung has fitted it with a selection of headline grabbing features including an innovative Smart Stay characteristic that utilises facial recognition style software to keep the screen illuminated as long as users are looking at it. On top of this the handset will play host to Siri esque S Voice dictation and voice command software with a selection of 16, 32 and 64GB storage options that can be further expanded by a microSD card. Maintaining the minimalist form of its predecessor whilst improving its staying power, the Samsung Galaxy S3 lines up at just 8.6mm thick and 133g in weight with a 2100mAh battery combating the rapid power drain experienced on most modern smartphones. An accelerometer and digital compass also feature. Taking a leaf out of Apple's book Samsung is to follow tonight's unveiling with a rapid turnaround that will see the Samsung Galaxy S3 lining retailer's shelves and consumers palms in a matter of weeks. Whilst Samsung has yet to formally unveil pricing for its next-generation handset, a selection of network providers included Vodafone, O2, T-Mobile, Orange and Three have confirmed their intentions to stock the device. A formal Samsung Galaxy S3 UK release date has been set for May 30th. 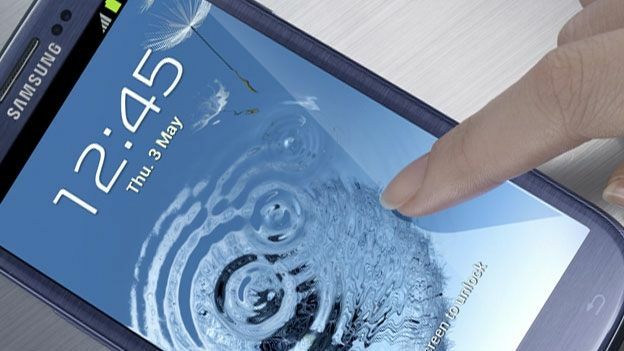 Are you impressed by the newly unveiled Samsung Galaxy S3? Let us know via the T3 Twitter and Facebook feeds or the comments box below.